Manchester City manager Pep Guardiola says he wants to "smell" his players' desire to leapfrog leaders Liverpool in the title race. 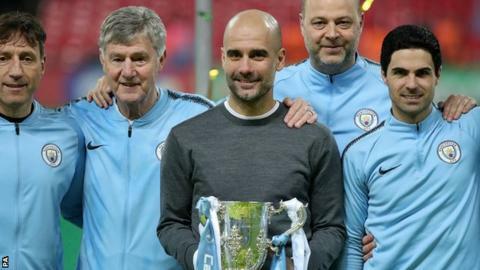 The Premier League champions remain on course for the quadruple after lifting the Carabao Cup on Sunday. City played for 120 minutes before beating Chelsea on penalties at Wembley, but Guardiola says he will not tolerate "excuses about tiredness". "In the last two months the mentality makes the difference," he said. "When you have the illusion to fight until the end, to retain the title, the power and the energy to give you that, it is higher than any excuses you can find. "I want the 'smell' in the locker room. I want to 'smell' in the beginning of the game, during the game, with our fans, that when one competition is over, really we want to win this title." Liverpool's 0-0 draw against Manchester United at Old Trafford on Sunday saw them regain top spot and move a point clear of City, but the Spaniard believes the gap is shorter than he expected it would be after Liverpool began 2019 with a seven-point lead. City host West Ham on Wednesday, with Liverpool at home to Watford (both matches kick off at 20:00 GMT). "Still they are leading this tournament, and so far, they were better than us, Tottenham and the other ones," he added. "There are still 11 games to play. It is shorter than I expected a few weeks ago but still they are leading. We have to focus on what we have to do. "It's in their hands but our hands too. The only thing we can do is put on pressure, so they feel we are there and we are going to win and win and win."